Hi everyone found this interesting bit about Buakaw from the excellent Muaymag. Muaythai superstar Buakaw Por Pramuk has gone far beyond any other Thai fighter. At the moment, he can demand a pay of 1.3 million Baht for a fight, which is undeniably the highest ever in Thailand. 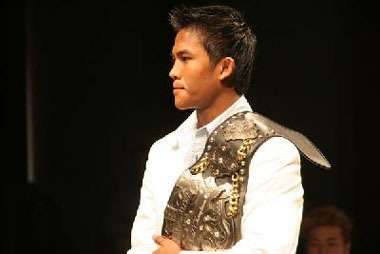 In the recent K-1 World Max 2009 round of eight, Buakaw was able to beat Nieky “The Natural” Holtzken quite decisively to earn a spot on the final K-1 bouts on October 26, when he will fight old rival Andy Souwer. Should he defeat the Dutch, Buakaw will pass to the final and fight either Italy’s Giorgio Petrosyan or Japan’s Yuya Yamamota on the same day. The winner of the bout will become the 2009 K-1 champion and claim the prize money of about seven million Baht. His manager Pramuk Rojjanatan said the other finalist is likely Petrosyan. “Buakaw has already fought Souwer twice. If he could beat him to pass to the final, I think he wil meet Petrosyan rather than the Japanese. Buakaw had a draw with him two years ago in Sweden,” said the manager about the October 26 event. Meanwhile, Pramuk said Buakaw will fight prepare for a fight on August 15 at the “It’s Showtime” event in Istanbul, Turkey, where he will be pitted against home town boy Murad Direcki. Buakaw himself is not much worried with his future fights. “The bout with Andy [Souwer]? I think I am not worried about that as we already know each other style well. If I had a good preparation, I am confident I can fight him and face Petrosyan in the final. I am confident I could win K-1 for the third time,” said the Thai legend. Asked about his future plan, Buakaw said he wanted to quit fighting in K-1 if he becomes the champion again this time. He is also dreaming of traveling around the world and propagating muaythai. “If all the weapons, including punches, knees, kicks, and elbows, are allowed, no other martial arts can match muaythai,” said Buakaw. What are your thoughts? Personally, I would prefer to watch Buakaw fight Muay Thai internationally too. It seems to me K-1 has limited interest in bringing Thai talent over to K-1 as well. I am speculating Buakaw wants another championship with K-1, a big pay day and then part ways. Some interesting comments too about the weight. I wish I had the link, but there was also an interview with Tanikawa and he stated how he’d like Buakaw to quit K-1 if he were to win a 3rd title. Statements like that are absolutely ridiculous. Tanikawa is becoming an insult to K-1. Even though K-1 has never been pure MT, some of the things he says borders on flat out ignorance. If Masato does take his place maybe we will see the ‘right’ competitors in K-1? Regarding Buakaw saying he would quit if he won a 3rd time, I’m torn in two ways. One, I have always loved seeing Buakaw dominate his opponents in K-1 even without the use of elbows/clinch work. On the other hand though, watching Buakaw fight around the world in full rules fights is very appealing. Just unfortunate that full rules Muaythai doesn’t have the publicity and popularity that K-1 (and other K-1 rules events) have. As long as Buakaw keeps fighting, K-1 or full rules, I think I would be happy with that. Masato needs to retire. His latest fights have included a 16-year old and an out of place MMA fighter who looked terrified of him. Not shocked with Tanikawa’s sentiments being that. But I have to confess my bias in this – I don’t really care much for or about K-1. Is this the ‘old story’ of Japanese Vs Thai martial arts being re told to the next generation of martial artists? If Buakaw was 20Kg bigger and could do a bit of ‘ground and pound’ just to get back on his feet, another fantastic career would ‘still’ go down in history. This one could be a UFC Vs Thai Martial arts story. Yes he has become too big for K1, and thats with no elbow and knees. Yes, Buakaw’s 8limbs need to be explored more. To quote a great man ‘I believe muaythai is the greatest and best martial art in the world, so I want to make it known to the people so that they can see with their own eyes. Now who said that? I bet he was a Thai wanting to use all 8limbs. haha, wanna see buakaw vs burmese lekwai ( just go to Burma to see the martial art better than muaythai).